As you may have already noticed, I love using brooches when covering my hair. Many women prefer using clips (often with some sort of vertical claw on a spring, to grab the cloth), but I find that these aren’t as secure, and don’t have as much variety in style. If you decide to try brooches, make sure that the pin itself is quite sharp (dull ones will just make you struggle to get it through the cloth) and try not to stretch the cloth too tight because you will make holes in your scarves. It’s the same logic as pinning clothes. For this style, I wrapped a simple long white scarf around my head, but instead of pinning the brooch on the side like I usually do, I used it to hold the back ends together. This also helped me avoid doing any extra knots (this particular wrap has none! ), which I have been told can make some ladies uncomfortable in terms of head movement. This wrap is so much easier than it looks! Take a long cotton scarf and tie it around your head with one end longer than the other. 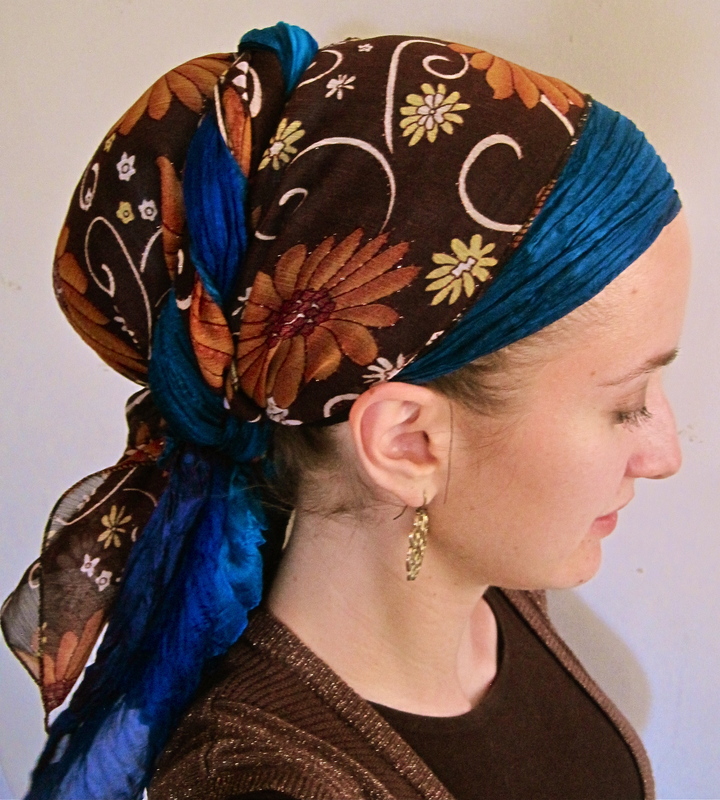 Then take another contrasting scarf and do the same a little farther back on your head. Take the longer end of the first scarf and wrap it over your head, tying it with the shorter end of the same scarf at the back. Then take the longer end of the second scarf, and do the same thing, letting the other layers peek through. Voila! This wrap is very similar to the last one. The first steps are the same; Tie two long scarves with one end hanging longer than the other. In this one, you take the two longer ends together, twist, and wrap them over the “bun” part of your hair, securing them with the shorter ones and letting all the ends hang. 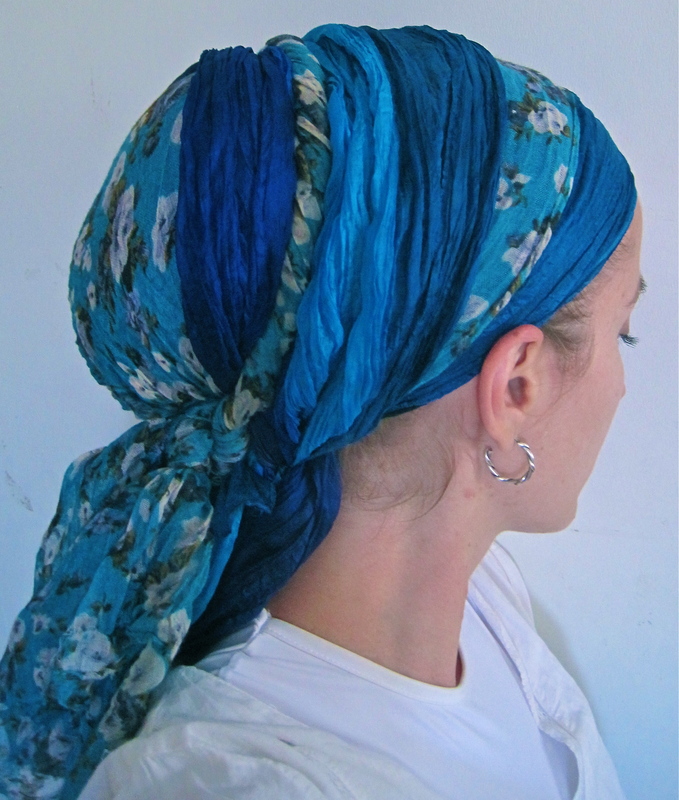 For this wrap, take two long contrasting scarves and tie them on your head, leaving room for the first one to peek out under the second, and making sure the ends are all hanging at an equal length. Take an end from the first scarf you tied (in the picture, this is the yellow one), and wrap it over your head, tucking the end in at the back. Now take the remaining three ends and braid. Wrap the braid around the back of your head, tuck the ends in, and you’re ready to go! 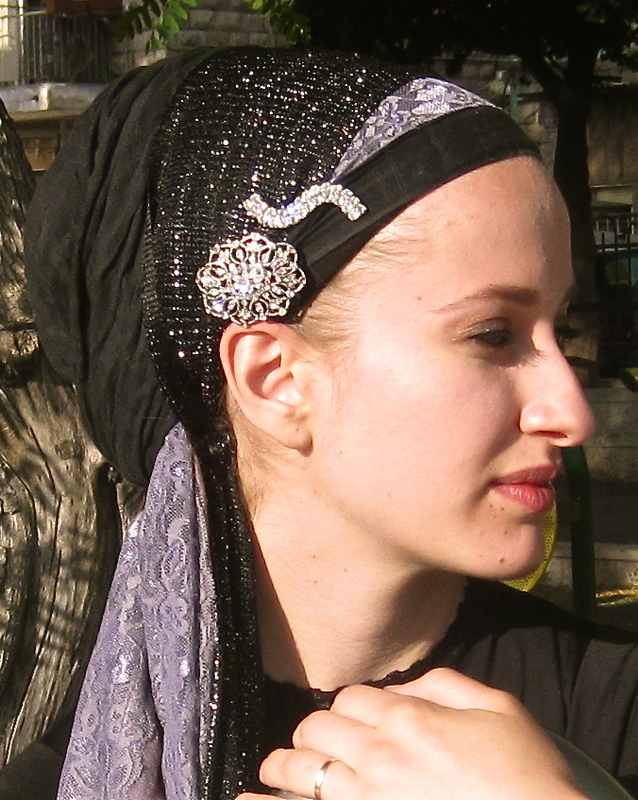 This tichel tie is exactly the same as the second one shown with one slight difference; When wrapping the last end over your head, give it a twist! I know this particular version of the wrap looks like I’m wearing a lot of scarves but one of them is actually striped in a multi-tonal way to make it look like I’m wearing more than one. If you can find scarves like these, I highly recommend them, because they make it look like you’ve done a lot more work than you actually have! This is a picture of me with my cello and many of you were asking how did this tie. It’s mamash embarrassingly easy! First I took a simple, black, cotton scarf and tied it with the ends hanging at equal lengths. Then I took a piece of long lace and tied it as well with the ends hanging. 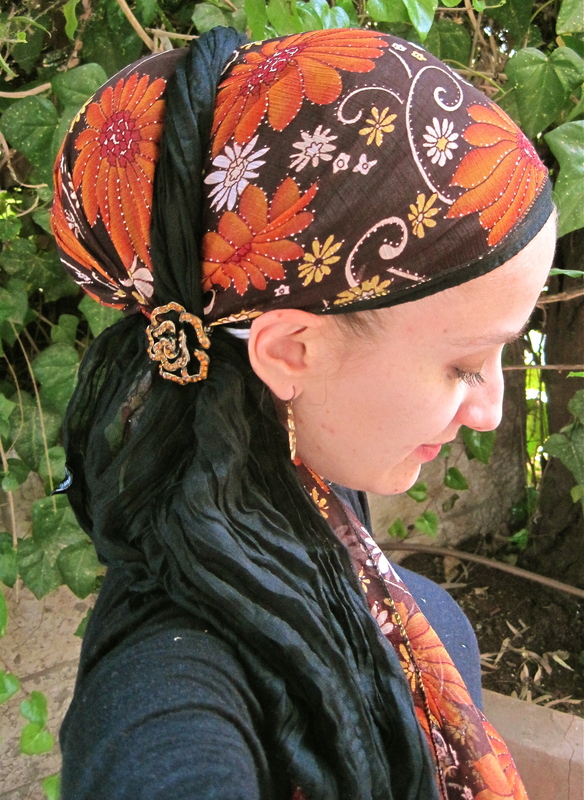 I wrapped both ends of the black tichel around the back of my head, and tucked the ends in. Then I took a long sparkly, black, ribbon sash thingie (do these have a name?!) and tied that around as well, with the ends hanging down. Then I found two sparkly brooches and pinned them on the side of my head. That’s it! For this last tie, I was rushing out of the house and really needed something that looked good enough for a concert, wasn’t too colourful, and could be put together quickly. I took a long, black scarf and tied it with one end hanging longer than the other. Then I took a long, brown, flowery scarf and tied it with the ends hanging equally. I adjusted the knots so they were at one side of my head. Then I took the longer end of the black scarf and twisted it around the bun, pinning it with a brooch at the side of my head. For this one, I chose to wear the bun (or volumizer/boubou, depending on the length of your hair) low down instead of where I usually place it, which is higher on my head. A few notes: You will notice in all the ties shown, that I have my ears showing. During the year in Chicago, I usually kept them underneath the scarves. Now that I’m in Jerusalem and it is hot outside, I’ve noticed that keeping them out makes me a lot more comfortable. If you do this, make sure that you don’t forget to apply sunscreen on your ears as well! In quite a few of these ties, I am wearing a volumizer/boubou underneath. I find that it just depends on how big you want your “bun” to look at the back of your head. If you use cotton ones like I do, it doesn’t make you overheat. 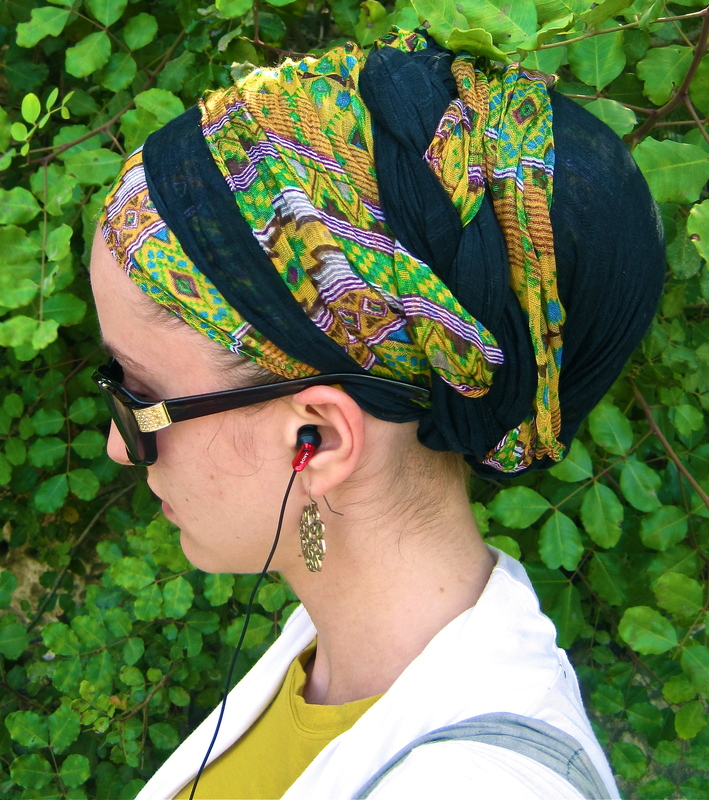 I am often asked about whether or not I get hot when covering my hair like this. Surprisingly, I’m not. Obviously, make sure that you use cotton/silk/breathable material scarves, and avoid too-dark colours if you’re going to be in the sun a lot. I have actually found that I’m cooler when covering my hair. For some reason, I feel like hair really heats up in the sun, and can be so uncomfortable at the back of the neck. Now that I cover my hair, my scalp doesn’t burn, and everything is out of my face. I hope you enjoy these ideas, and if you need further explanation, please let me know! I have found it difficult to make videos while staying in Jerusalem, but hopefully I’ll be able to make some step by step, instructional videos soon. You have the soul of an artist! As for the heat, a simple solution is to wet a scarf, wring it out and put it on top of your head (it usually doesn’t look wet, or you can put another scarf on top of it). The evaporation removes thermal energy from your head and keeps you cool for several hours. It’s like walking around with a personal air conditioner on your head. Sari, this is fabulous advice, THANK YOU!! I live in TX and its 100 degrees and higher this year. I will have to give it a try. Thanks for the idea. Now there’s my answer! Any bleeding of colors when using more than one? I usually wear a sheitel, but lately I am feeling very uncomfortable. I started to use hats and scarves, you have amazing ideas thank you so much for this blog! Simi, thank you so much! I’m so glad that I can help give ladies new options! I’m breathless at how gorgeous your tichels are! I’ve worn tichels for years and never made great use of brooches. YOu’ve made a bleiver out of me ! 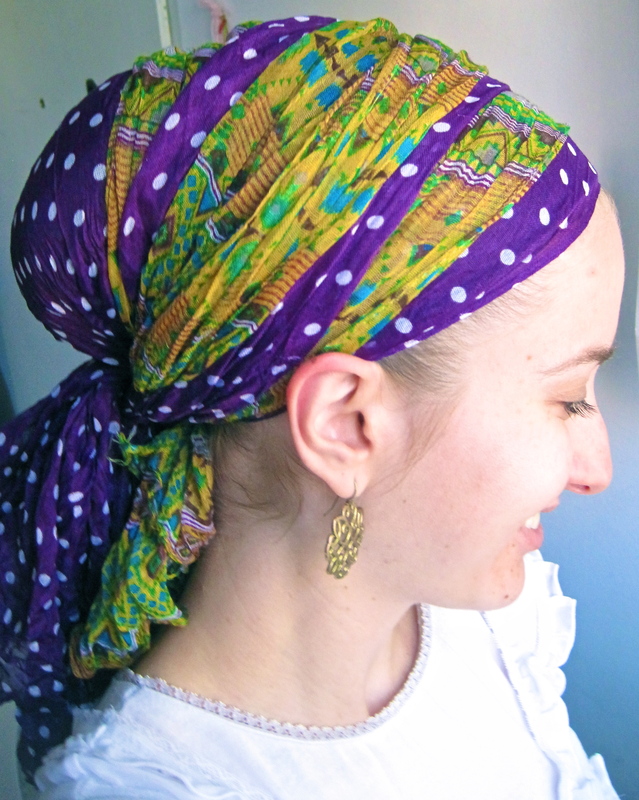 Just be careful when wetting scarves – the Israeli/India scarves are not usually color fast, so if you wet a white scarf, for example and use a contrasting color, the other color may bleed onto the white scarf. If you are using two of similar color, it may not be much of an issue. Great advice, thank you! Hopefully ladies here won’t have to learn the hard way. Usually, if you have already washed a scarf once, it won’t bleed anymore. I have posted a video for the double braid wrap, as well as the over/under tie! Let me know which other ones you would like to see! how do keep all of this from slipping off of your head- I find this happens even with one scarf- of any material. With all of the weight you have there what do you do? Hi Chava! Try investing in a “grip comfort band” (give this a search and you should find sites that sell it.) It can be pricey (starts at $15), but it is SO worth it because the tichels don’t budge! It’s basically stretch velvet headband that you wear underneath, and the ridges of the velvet “grip”, creating friction so your scarf is unable to fall off. I had a friend recommend them to me a while back and I am so grateful! It works with even silky materials! I have 2 scarfs that I bought from Israel and washed them over a few times and they still bleed so be careful! Unfortunally they are starting to look faided and they are washed by hand in cold water. The American made scarfs don’t seem to bleed as much. But I have bought 2 cheap ones from Wal- and they bleed. I just bought the grip comfort band, its great! It really grips. where can i get a volumizer from? i LOVe these styles, but have a really difficult time wearing them b/c my ponytails are not this high. Can u plz post some pics where the women wearing a wool hat with their earz tucked out? What is a volumizer, where do you get one? Also, how did you tie the scarf in the last picture? Do you have a video of it? They are all beautiful! Do you have a video for the first wrap, the one with no knots? 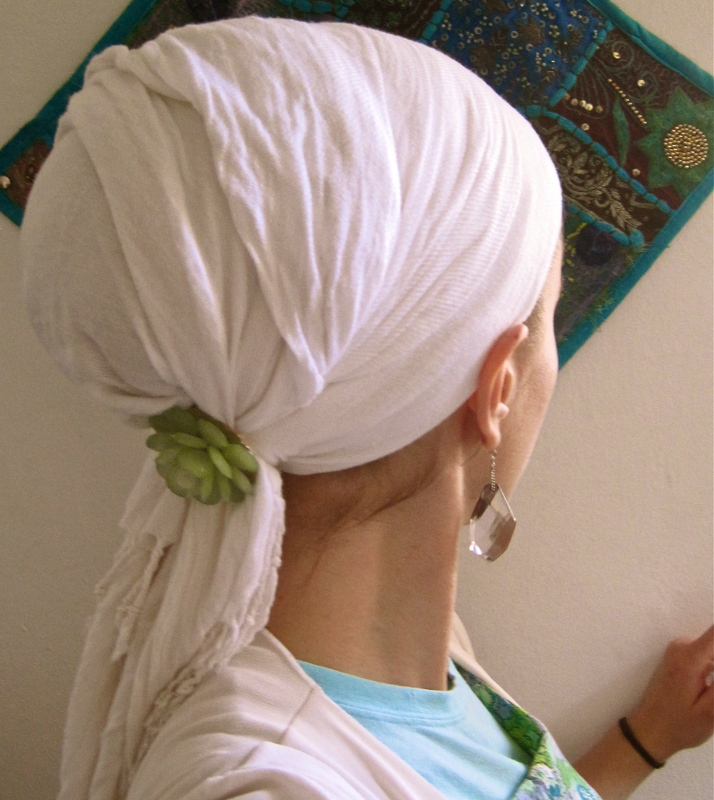 What a wonderful idea in wetting down your tichel in the heat., as well as wetting down the hair. Covering after June was becaming a worry for me as we get pretty hot here in upper Idaho,….but now I have the solution….thanks for the tip. How very helpful and I would not have thought of this….I wonder how long both hair and tichel stay damp? I love all these ideas. I am starting to lose my hair from chemotherapy treatments. I pray it comes back, I dislike wigs as they are to hot. I use a damp terry cloth headband to keep me cooler.